Garlic is a very potent natural substance that stimulates the immune system and also fights bacteria found in the intestine. Many garlic capsules are available on the market, but unfortunately, not all are effective. There are a few ways to determine which garlic capsules are best. The amount of Allicin, the antibacterial component of garlic, whether or not the garlic is enteric-coated, and if it is odor-free all should be considered before purchasing a particular brand. Garlic capsules should always contain at least 4,000mcg of Allicin, the medicinal and antibacterial component of garlic. Naturopathic doctor Tori Hudson recommends this amount of Allicin to work as an anti-fungal and immune booster, and to consume two garlic capsules a day to fight yeast infections. 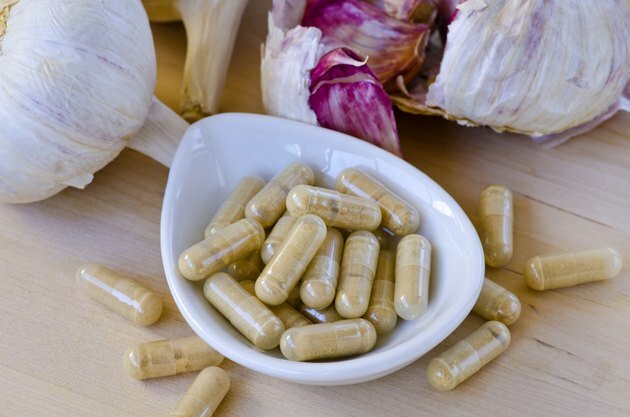 To maintain their effectiveness, garlic capsules should be enteric-coated. This barrier on a capsule protects the garlic from being released before it enters the small intestine, where it is most effective. According to Nature's Medicine, without the coating, the garlic breaks down in the stomach, rendering the active ingredient useless. Although the choice to have odorless garlic supplements sounds helpful, What Doctors Don't Tell You recommends skipping these brands. They note that odorless garlic pills are usually cooked, and this inactivates the enzyme that breaks down alliin in order to make allicin. On occasion, an odor-masking compound such as chlorophyll is added instead of being heated, though this does not appear to be effective in reducing odor.